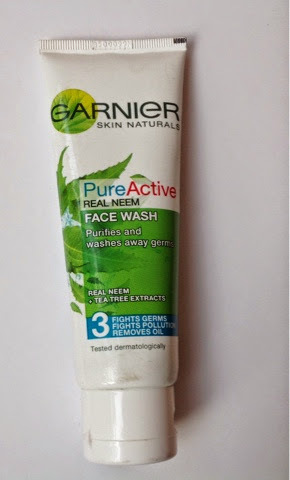 I guess everybody has had acne at some point of time , the degree may vary from person to person .A common place skin condition but it can affect the emotional and psychological state of a person too .So today I am going to share my experience with a very popular face wash -the Garnier Pure Active Neem Face wash . 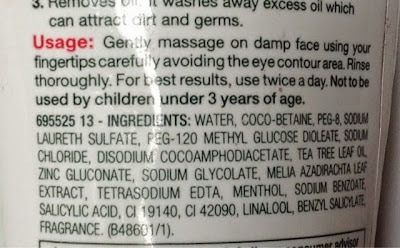 Product description - It comes in an opaque, white plastic tube with a flip -open cap .This packaging makes it handy enough to carry in your purse or backpack .It is easy to dispense product but you cannot see when your tube is getting empty .You can see the list of ingredients in the pic below .As mentioned in my post Acne -Causes and Management , it does contain the most important essential ingredients for a clearer and blemish free skin. 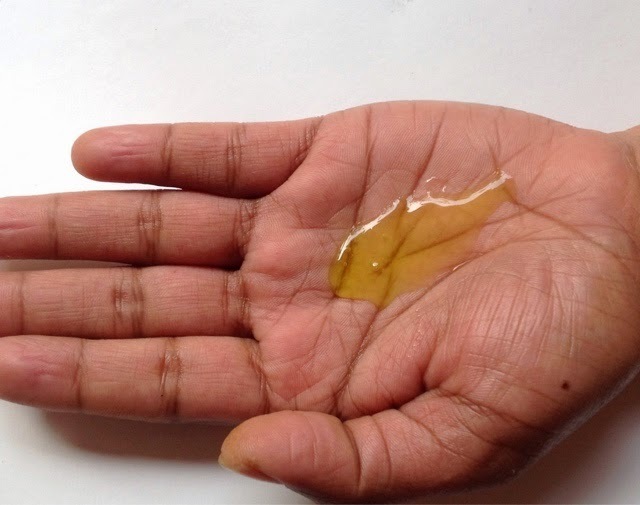 Usage tips - As mentioned in the image below , take a small amount on the palm , rub together and apply gently with fingertips on wet face , taking care to avoid eyes , as it can sting .Rinse thoroughly after about 30 seconds ,For best results , use twice daily -morning and evening . 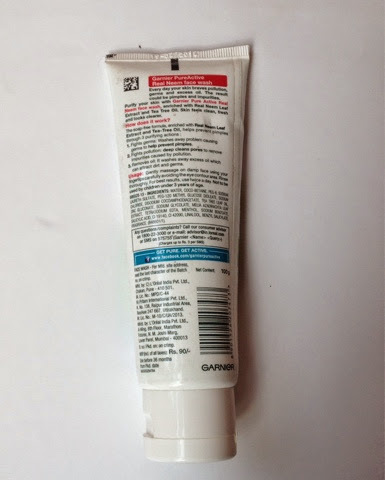 2.Easy to carry , travel friendly .Also comes in 2 sizes , so while travelling you can go for a smaller tube and keep the bigger one at home .Though since it is easily available you'll probably be able to get it wherever you are travelling to ,unless it is a remote village or jungle ! 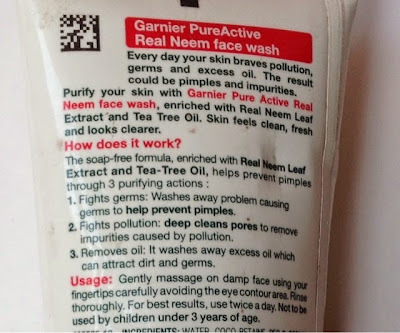 4.Nice green coloured product that spreads easily over damp face .I have a thing for green ,not the goo-ey ,slimy kind but the mint fresh , green leafy kind of green, It gives a cooling feel just by looking at it . 5.Fresh ,green and mild fragrance, mild fragrance is a plus point for me as I get headaches with stronger fragrances . 6.Contains the goodness of Tea Tree leaves oil and Neem (Melia Azadirachta) leaf extract these have anti-bacterial as well as anti blemish properties ,so regular will reduce the existing acne and appearance of new ones .So it contains natural anti-acne ingredients . 7. 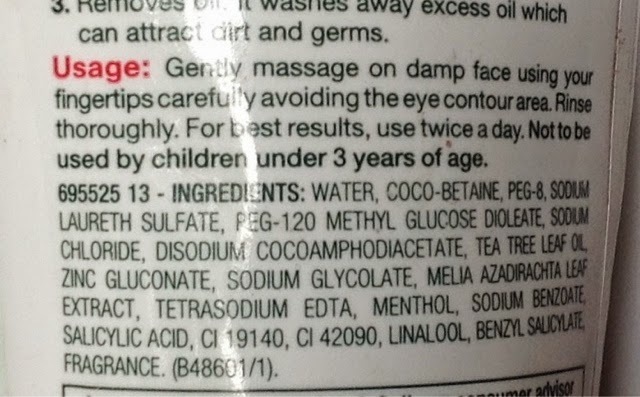 After using it ,my skin did not feel stretchy , it had a slight cooling sensation , does not lather much so easy to rinse off and yet it did make my face feel fresh , clean and pure . FINAL VERDICT - I rate it a 4.8/5 , Minus marks only for the CONS mentioned above .May not help severe and cystic acne which needs medical intervention only but all in all a very good quality product for mild to moderate acne without giving any unpleasant associated dryness and roughness .Gentle enough for everyday use and strong enough for combating mild to moderate pimples and acne marks with regular use . 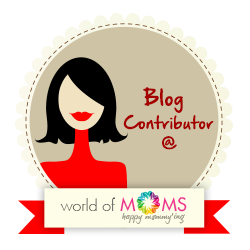 How did you like this post ?What is your experience with acne and how did you deal with it ?